My first podcast emerged from 2008. I wanted the student news satire radio show, made by me and Sam Wong, to reach more than 3 people. The university had a website where you could stream stuff, which was great [but not download]. Unlike the music shows however we didn't have any rights issues; due to our opinions not being valued by the Recording industry Association of America. We decided we would offer it as a podcast. It got us hundreds of new listeners, which for us, was awesome. We were now accessible to anyone at their whim, for download from RSS feeds and itunes. After that I did work experience at the BBC for a month and then started work at the British Medical Journal, making educational podcasts about Swine Flu. It was an interesting time, and perfectly suited to the quick turnaround medium of the podcast. Especially as the BMJ wanted to increase is online offering; moving toward being an 'online first journal' jabbing at the cutting edge of digital publishing. It proved to be very popular for us, and gave me a job. After swine flu, we moved on to doing more esoteric, nuanced, debates which we felt would benefit from having someone talk you through the issues. In educational terms, they're great for debate, and discussion. It's like listening in on a great conversation. Also, a fundamental point is the web-based nature of podcasts allow you to have a landing page with links that build on what has been discussed. These links then point you in the direction of more information giving you a chance to investigate opinions further for yourself. The internet is full of all the knowledge, but we need 'experts and gatekeepers we respect and trust' to direct us toward great content. If you have a trusted brand, or are an expert in something, it's a great way to deliver your message. During #Talkfest people played some brilliant audio clips, but as these clips played I got anxious about what to do with my eyes, where am I supposed to look? Normally I'm fine, but occasionally I find mid-conversation I think about eye contact and panic about how much eye contact is weird, am I making too much or too little? What is the ratio? Is there some etiquette list out there somewhere? 'E-How - To maintain a healthy level of eye contact, communication experts recommend looking someone in the eye for intervals of four to five seconds, then looking away briefly -- at their mouth or nose or at something nearby -- then re-establish eye contact. LET US compare these two players. each of those little cubes is a comment which flashes up as the playhead travels along the song. Not essential in order to enjoy the audio, but a nice interactive adjunct. I agree this is possible, but also that, audio particularly, is sometimes the most immersive medium around. Audio's challenges, are also it's strong points, and I guess that's why the digital era is so exciting, as we can build on these, and start to move away from arbitrary audio/video/text delineations. 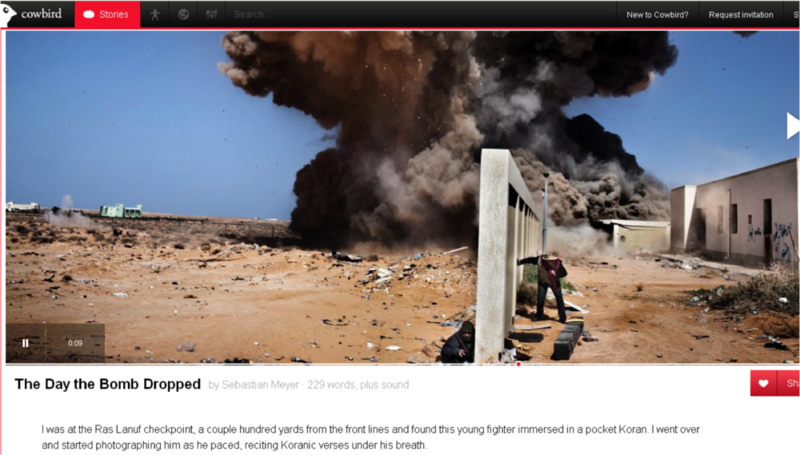 Cowbird is a new storytelling startup which looks really cool. You have a large image, which you can kind of pan around, whilst listening to a short-story piece. It could be fiction, or someone interviewing a relative. I think some of these come out beautifully and I will try to make my own one soon. The phenomenon of the 'produser' and the massive democratizing effect of technology is having a real impact on storytelling. I heard someone recently state that the idea of sitting down to a 90 minute film, will be seen as a real anachronism; a kind of blip in the history of culture. It's an interesting idea, but I certainly feel like a powerful short film, audio piece or poem, or combination of all three has so many different chances to live and be consumed that hopefully the best ones will find an audience. If you want to make a podcast, you probably already have the equipment. Radio Kate, works at Audioboo and this fantastic clip emphasises how you can capture something awesome on a mobile phone. Another favourite podcaster of mine is Daniel Ruiz Tizon - he recorded probably somewhere in the region of 100 hours of podcasts on his Blackberry, and for the most part it's some of the most original, compelling, podcast content I've heard in a while. A significant portion of the audience discussion focussed on the quality of audio, and whilst it's definitely an issue, I'm so in the camp that ideas are worth way more than quality. If you consider how we can tolerate a crappy phone line for an hour, if the other end of that line is making us laugh or think then it's not such a big deal. Treat the microphone like a camera, with close ups, mids and wide shots. It's a really effective way of layering sound, and giving some contextual clues to help people anchor themselves in space, working the subconscious. Michelle also emphasised the importance of the first minute of your audio, but I would also urge listeners to bear with podcasts for a bit, part of the joy is the slow burn potential.
] have internal podcast teams, some have links with podcasts [formerly Times and the Bugle]. Some commercial outlets support podcasters [David Mitchell's Soapbox]. Increasingly traditional broadcasters are getting on board with people who tested their ideas in digital media. Consider Black Cab Sessions - originally a couple of guys filming bands in the back of a cab for one song, for putting on youtube. Several years later, they now have their own Channel4 show which took a Black Cab to America. Black Cab Sessions USA from Black Cab Sessions on Vimeo. Robert Llewelyn's video podcast in which interviewed people whlst driving around in his electric car, was originally sponsored by an electric car manufacturer, and finally became a show on TV station Dave. Ricky Gervais' podcasts went from being hosted by the Guardian, to being turned into animated cartoons for HBO. has probably given me 100 hours of entertainment for FREE, it would seem bastardish to not feel like chipping in when you think of it like that. , a long time podcaster, articulated how people feel inclined to come out and watch his shows because of how much entertainment he's given them via his own podcasts. They don't just see it as £10 for an evening, it's a more nuanced transaction. It's also a great medium for testing material, and getting yourself out there to new audiences. - American Music podcasts, always food for thought.